Is there a season for airline rebranding? With new logos and aircraft paint schemes introduced by three U.S. carriers just this month, you might think so. First, there was Southwest, closely followed by Frontier. And this week, it’s Spirit’s turn. 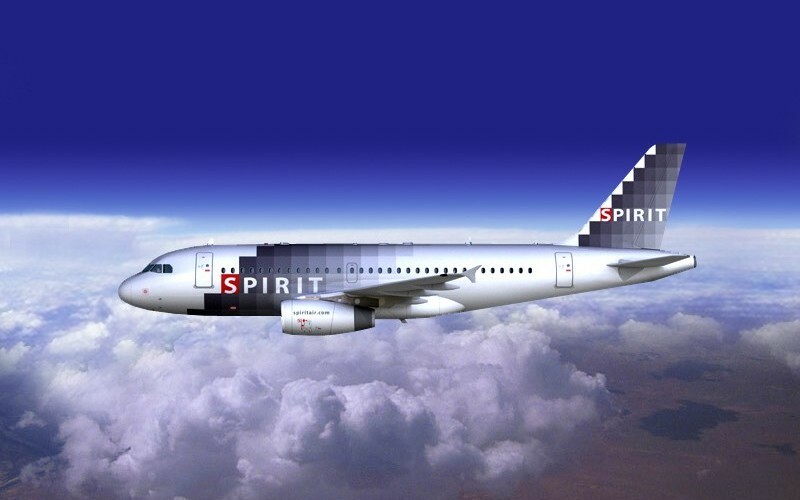 The new paint scheme for Spirit’s planes can best be described as eye-popping (although “flamboyant” and “blinding” also come to mind). The planes will be sprayed all yellow — think taxi-yellow — except for “Spirit” and “Bare Fare” printed in bold black. The first plane sporting the new look will be in the air today, flying between Atlantic City and Ft. Lauderdale. It could take as long as three years for Spirit’s entire fleet to be repainted in the new colors. According to the Chicago Business Journal, the two-tone scheme was chosen in part because it’s cheaper than the multi-colored liveries used by other airlines. That, of course, is entirely in keeping with Spirit’s ultra-low-cost business model, which has earned the airline low marks for customer satisfaction and industry-leading profits. The company is currently engaged in a vigorous campaign to soften its customers-be-damned image, including a concerted effort to explain the reasoning behind its Bare Fare pricing, and its supposed benefits to consumers. That’s a work in progress. For now, travelers will have to glean what satisfaction they can from Spirit’s shiny yellow planes. How meaningful are airline makeovers to you?